After several months of waiting in agony, Great Adventure fans can know what exactly it is they’re receiving for the 2011 season – The Green Lantern. The Green Lantern will open in the park’s Boardwalk section in 2011. The ride’s green and black paintjob will stand out from the parking lot – offering a more twisted look than the neighboring Kingda Ka roller coaster. The Green Lantern is slightly similar to the park’s Bizarro roller coaster – but the main draw of the coaster will be the riding position – riders will ride standing up. The stand-up coaster will be the first one in the area since Shockwave, an Intamin stand-up, was moved from Great Adventure to Astroworld during the mid-90’s. Ironically, Great Adventure will have had some of the oldest stand-up technology and the newest in the same general area. The Green Lantern will be themed to, you guessed it, the infamous DC Comics character who has been around since 1941, and will be starring in his own movie coming out in 2011. The Green Lantern will make Great Adventure the B&M Capital of the World – with five world class B&M roller coasters, including B&M’s best creation according to the Golden Ticket Awards – Nitro, as well as B&M’s first floorless roller coaster Bizarro, Batman: The Ride – one of the first inverted coasters, and Superman: Ulimate Flight, one of the first B&M flying coasters. The Green Lantern will be the fifth DC-comics-related coaster at Great Adventure, and is sure to be a huge hit. It will also bring the back of the Boardwalk-themed area to life, especially since it will be next to Superman: Ulimate Flight, one of the park’s other huge draws. One thing I’m curious about is whether or not the ride will feature immersive theming – while the park did a good job theming Batman: The Ride and The Dark Knight Coaster, Superman: Ultimate Flight and Bizarro featured lackluster theming at best – hopefully the ride will have very immersive theming relating to the Green Lantern theme – and the movie tie-in can really help this. The ride is also supposed to have two short tunnels – a first for Great Adventure roller coasters. The ride has been moved from Six Flags Kentucky Kingdom (where it operated as Chang), and taken right out from under the nose of Six Flags Great America, where it was supposed to go until Al Weber became the new CEO of Six Flags. I think the decision to give it to Great Adventure makes sense – Six Flags Great America already has a stand-up roller coaster, Iron Wolf. In fact, it is the first B&M roller coaster. While it’s highly unpopular at the park, management opted to get the stand-up before the design was perfected – and this is what happened. If Great America bought an iPhone, and an iPhone 4 became available – should it go to Great America, who already has one, or a park like Great Adventure, who got their “iPhone” taken away? I will admit, I am a bit biased … but on the whole it makes sense. Unfortunately, parks like Six Flags America and Six Flags St. Louis could have received the coaster, but they don’t make the profits that parks like Great Adventure make due to their location. As a Great Adventure fan, I’m extremely excited by this announcement. What do you think? Leave us your park thoughts, s’il vous plait. Six Flags Over Georgia Announces Dare Devil Dive! It seems like the first Six Flags 2011 project has been announced. Six Flags Over Georgia will be recieving a Eurofighter, named Dare Devil Dive, for the 2011 season next year. This marks the first Eurofighter for Six Flags parks, and should proove to be a popular addition. The coaster claims the country’s first beyond vertical dive – which is a lofty thing to have, except for that fact that it isn’t the first coaster in the US to go beyond vertical on the drop. Several coasters, including Fahrenheit at Hershey Park and Steel Hawg at Indiana Beach already go beyond vertical. One other thing that can be noted about this ride is that the name isn’t entirely unique – Dare Devil Dive is actually the name of the Skycoaster model at Six Flags Great Adventure as well, although most people aren’t likely to notice this. Interestingly enough, this is one of many links between names at these two parks, including Batman: The Ride, Superman: Ultimate Flight, and The Great American Scream Machine. Despite this slightly misleading feat – this coaster should prove to be popular at one of Six Flags’s original parks. Except more Six Flags announcements coming soon! 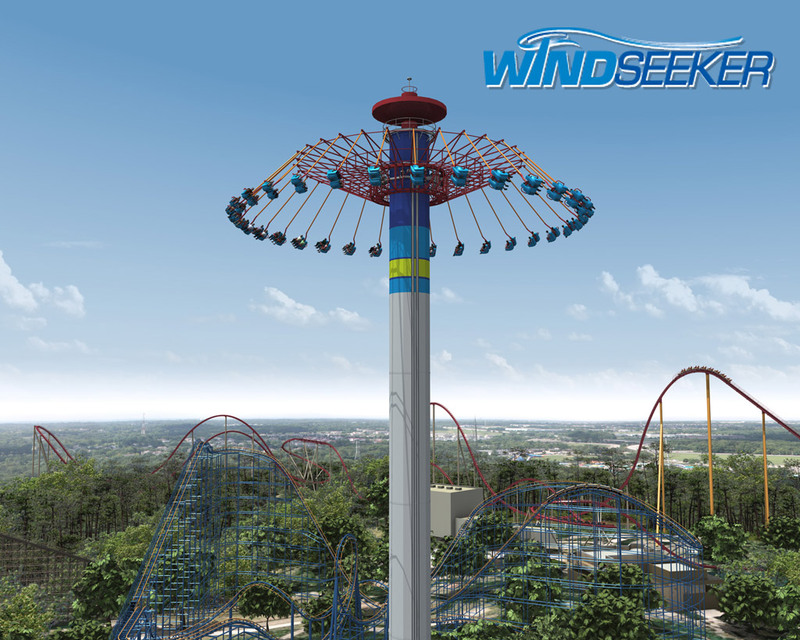 Cedar Point’s Facebook page has just announced their new 2011 attraction, Windseeker! 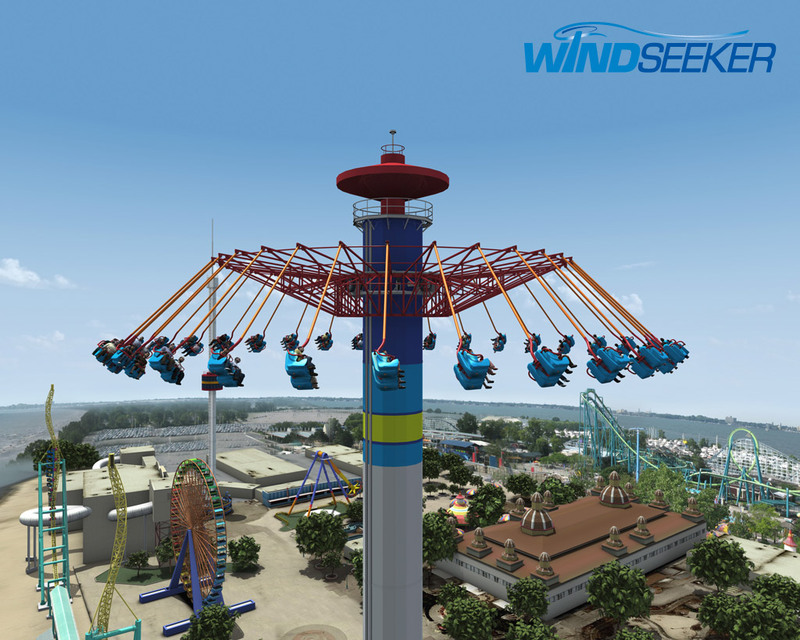 It will be located on the beach right next to Wicked Twister, the park’s Intamin Impulse coaster. It will be an exact clone of its counterparts in Knott’s Berry Farm and Canada’s Wonderland. For more information on these rides, you can read Ethan’s post located directly below this one. The same ride will also be flying into Kings Island in Mason, Ohio for the 2011 season. It will be located in the Coney Mall section of the park. What do you think about these two Windseekers? Leave your comments and Park Thoughts below! Wow. What I thought was dead has seemingly been revived. 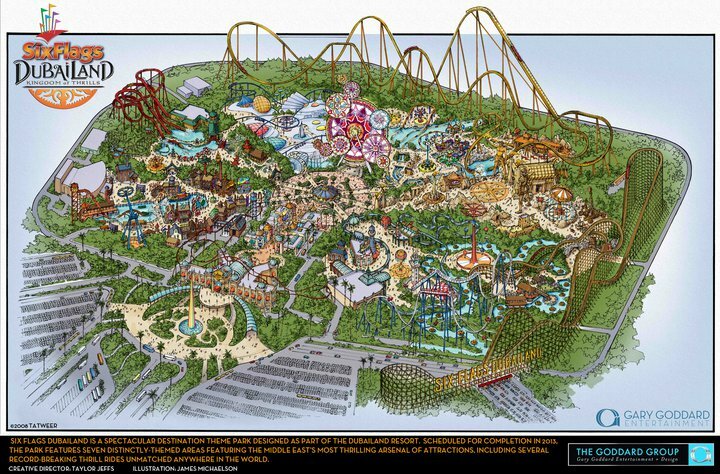 Six Flags has released some artist’s renderings of what Six Flags Dubailand will look like. If you have read and seen the pictures already – don’t close the page yet. You haven’t read my opinions. An overall view of the park.